Here is the start of my Sew Small contest entry for Pattern Review. 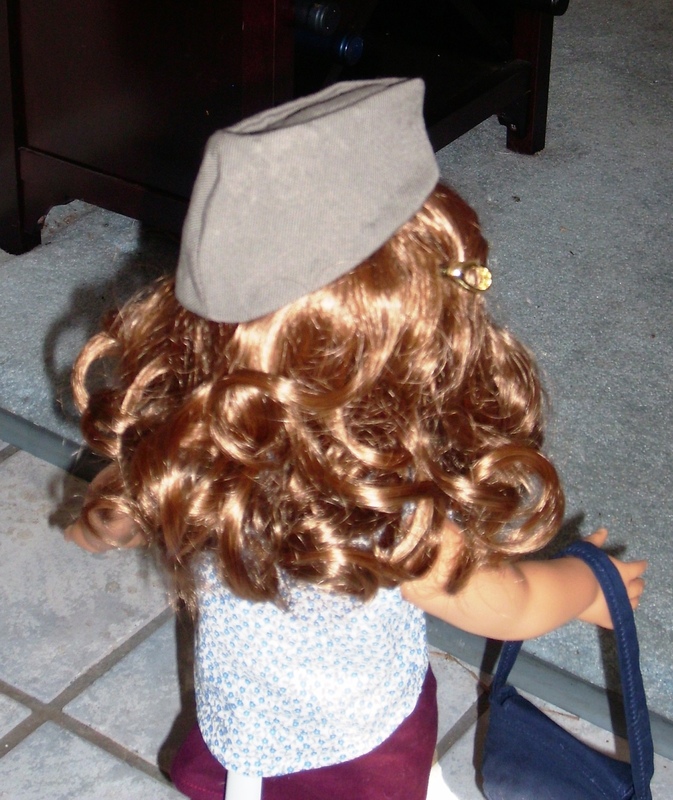 This particular blog post is going to cover the doll skirt, hat, and the purse that I chose for the contest. The second post will cover the top and the pea coat when it is finished. So let’s start with the purse first. 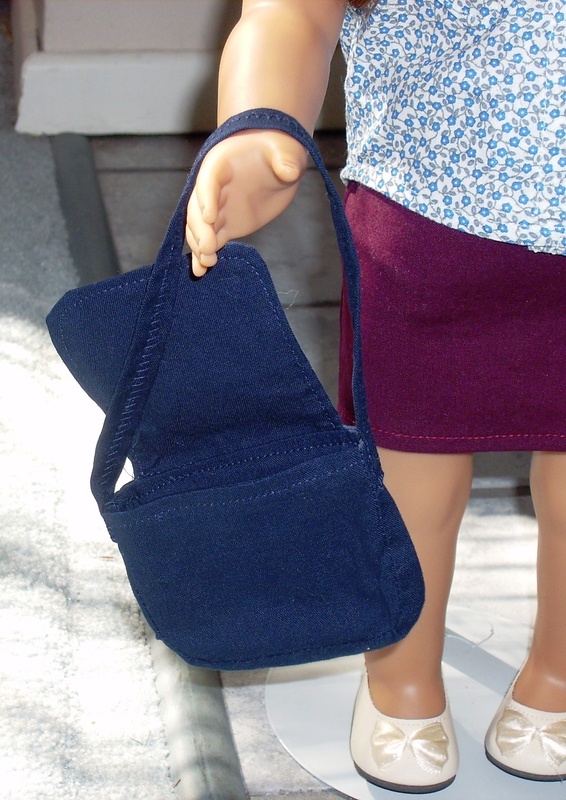 I used the purse from Molly’s pretty clothes which was released by the Pleasant Company in the 1990s. You can get the pattern for free from AG Playthings . I used some of the navy cotton I had left over from the bodice of the dress I am making for my sister’s wedding. I didn’t follow the instructions for the pattern. I decided to change and do a lined purse especially since I started this right after I had finished up my second purse for the Sew Powerful project. So for the lining I cut two 3.5 inch by 4.5 inch rectangles. I followed what I had done for the lining pieces in the Sew Powerful purse project; sew together with an opening at the bottom to turn through. My lining pieces were probably too big- then should have been about a quarter-inch smaller. For the strap I folded the ends into the middle then zigzagged stitch down the center. The skirt is the from Lee & Pearl. It is the slim skirts pattern number 1041. I actually ended up making a denim version and a pencil skirt version. The pencil skirt version is for my entry in Pattern Review’s Sew Small contest. The pattern rating of easy/intermediate is fairly accurate. 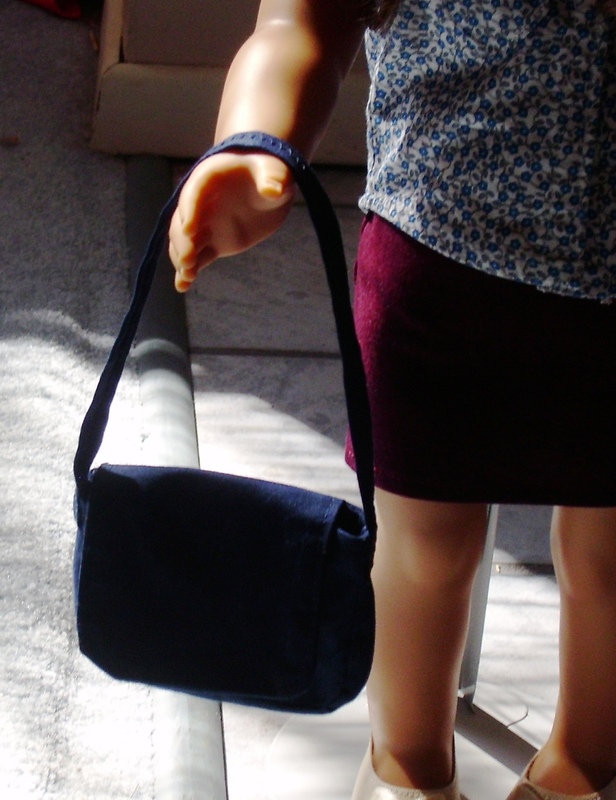 The intermediate rating is mainly for the denim skirt’s pockets; however, if you have used the Liberty Jane jeans or Lee & Pearl’s Bonjour Paris, the pockets should be fairly easy to construct. Molly is wearing the denim skirt I am not entering in the contest. I really just made it because it was so cute. I didn’t do all the top stitching since this was mainly for me only. I love that it had the pockets (I really should have put something in the pockets so everyone could see). As always noted, my Molly doll is from around 1993 to 1995. 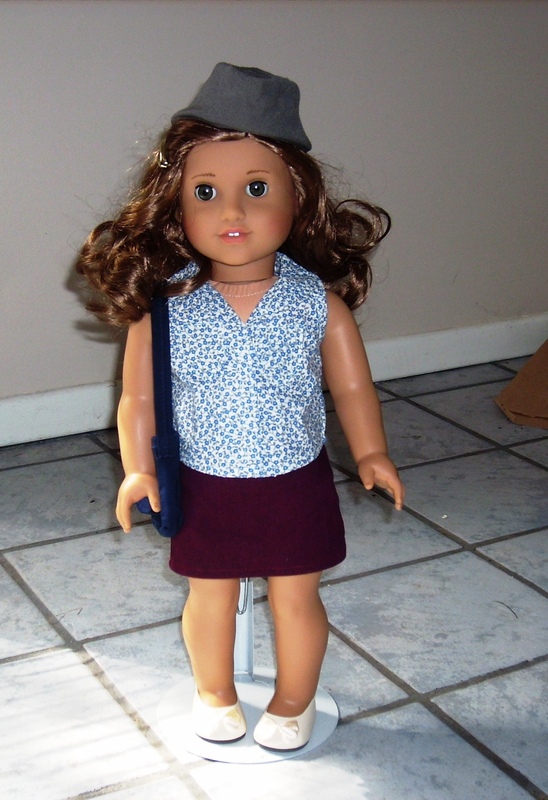 I didn’t do any alterations to the pattern and the skirt fits her very well. I didn’t add the belt loops as I wasn’t sure I really wanted to hand stitch those if my sewing machine didn’t like thick fiddly belt loops. Now for the burgundy pencil skirt that Rebecca is modeling. 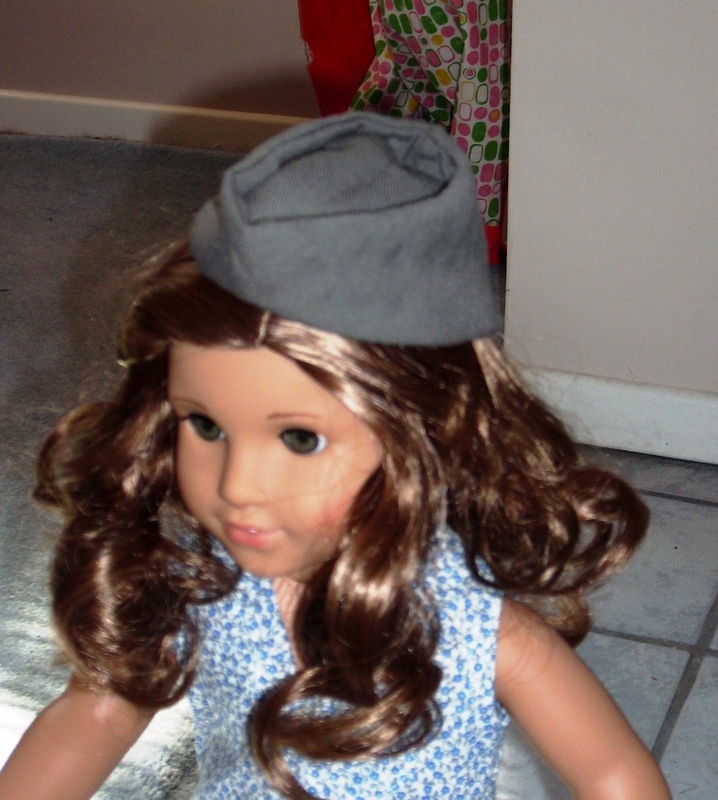 I got Rebecca as a Christmas present in 2013 so she is a Mattel made doll. Again there were no pattern alterations. The skirt fits Rebecca fine. 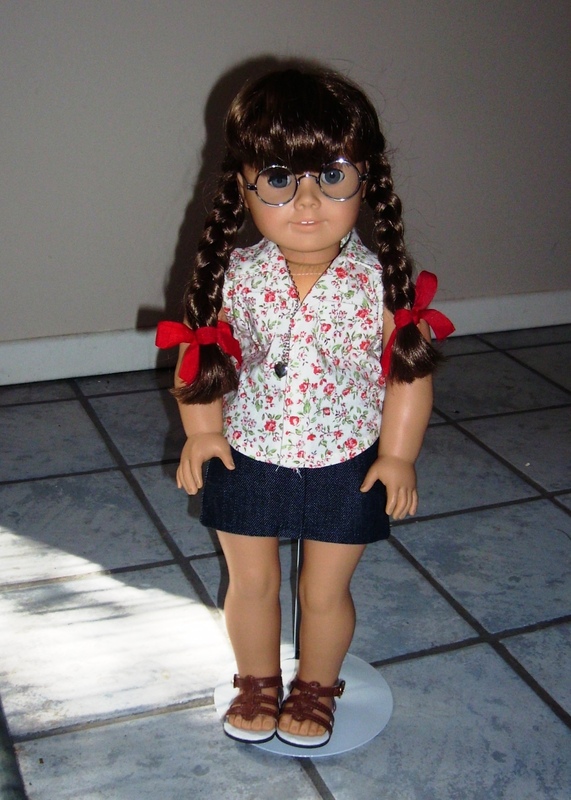 Based from what I see on the denim skirt, I don’t think older dolls will need any pattern adjustments. The back waist of the pencil skirt does have two darts for a little bit of shaping. I hadn’t originally planned on doing a hat for the outfit. But last week when I wasn’t feeling well, I decided to cut out the Lee & Pearl Glengarry hat #2021. It was a lot fewer pieces to cut than the pea coat when I didn’t feel well. Over the weekend I finished up Rebecca’s Glengarry hat. I used the grey wool flannel I had in my stash for the outside and the blue floral quilting cotton for the lining. Since the wool flannel was mid weight I didn’t interface any pieces. I didn’t add any decoration to the outside of the hat since I didn’t have anything at home that would work but there are instructions on how to make a ribbon cockade included in the pattern. This hat came together in the matter of a couple of hours. It was very easy to sew but not as easy to press the seams with a normal iron. With the small seam allowances, curves, and tight spaces this is hard to iron without burning oneself. In fact so much so that I would not recommend this pattern to a beginner. I feel that one needs great ironing skills to be able to do this pattern. Don’t get me wrong, I love the hat and the pattern is well drafted. I like that it takes a minimal amount of fabric and I will probably make it again. But I may go and see about buying a smaller iron before I make it again. So I have several projects done, but I really haven’t made time to get pictures lately. Right now the stack of projects for pictures includes 2 scarves/cowls, one beaded bracelet, one skirt, one dress (which had been finished for quite a while), and a couple of tops from Maria Denmark. But instead of working on blogging that pile, I decided to take time to blog about the sewing class I just took over the weekend. I took the two-day Bra Workshop with Anne St. Clair. It was two very intense days but the end results were great. So Friday night was the fitting and lecture. Beforehand, I had sent the requested measurement to Anne so she was able to pick out one of her fitting bras for me to try on. The lecture went over part of the bra, how a well fitted bra components should look on the person, and the differences between ready to wear and making your own. I don’t have any pictures from the actual class. I was too busy sewing. Anyways, I left my camera at home. Saturday was completely dedicated to sewing the bra. I was given the Queen Elite pattern. I made a 37 F in size. The fit is very good. I need to readjust the straps to be a bit shorter. This was made using power bar fabric, tricot, elastics and under wires. One of the hardest parts was to insert the channeling. It needs to be stretched as it is going in so that took several tries. I have enough fabric to make at least 4 more of the Queen Elite bras. My only modification will be to add a little bit of batting to the cups. It is more personal preference but I feel like two pieces of thin fabric is not enough for the cups. I am currently working on my entry into Pattern Review’s sew small contest. 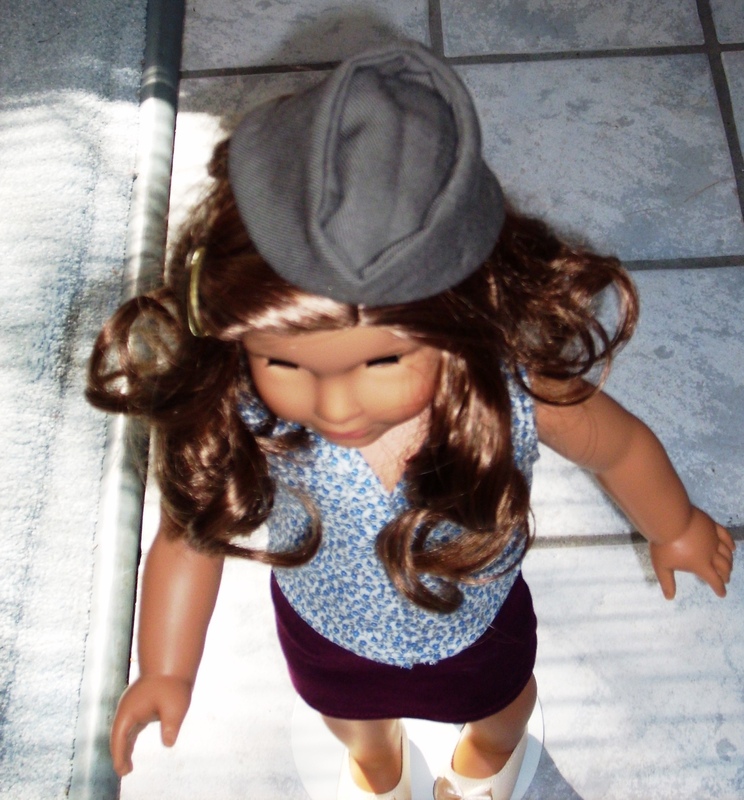 I decided to do an outfit for my dolls. I tried to keep with patterns I haven’t used yet except for the top (that is Simplicity 1086). 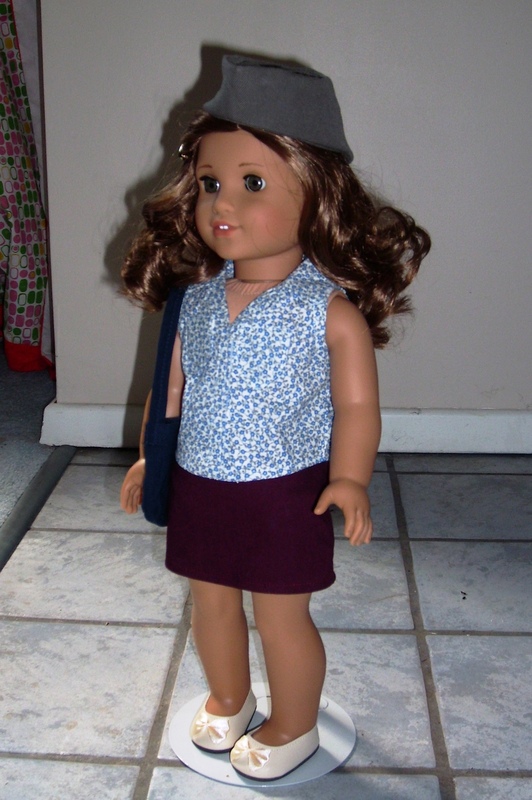 My original plan is a purse, top, skirt, and coat. Last night I cut out the Glengarry hat from Lee & Pearl so that got added too. As for other fall/ winter sewing plans, I would like to follow along with the McCall’s pattern sew-along for Vogue 1467, Closet Case Files’ Ginger jeans and the Jalie jean pattern that is so popular, the Jasper dress, t-shirts, underwear and maybe Butterick 6018 (that 1912 coat). I don’t think I am ready yet to tackle the Colette patterns Lady Grey coat.